The EPFD Cadet Program is designed to introduce interested young men and women in the community to the firefighting profession while providing a valuable service both to the community and the District. Cadets are trained to assist the District’s firefighters on the fire ground as well as with emergency medical and other services provided by the District. While not allowed to participate in the kinds of hazardous or dangerous activities associated with fire suppression, skills learned through training alongside the District’s paid and volunteer firefighters will help prepare these young men and women for a career in the fire service. The EPFD Cadet Program is designed to introduce interested young men and women in the community to the firefighting profession while providing a valuable service both to the community and the District. 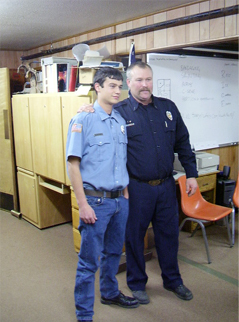 Upon recommendation of the instructor, ant student enrolled in the fire science curriculum offered by Bret Harte Union High School who wishes to participate in the program may do so with permission of the Fire Chief. Membership may be extended to any person between 14 and 15 who is the son or daughter of a regular member of the volunteer or paid divisions of the District and is in his/her eighth grade of school. Must pass physical examination, after probation. Interested persons must attend four drills as an observer. After completion of his/her fourth drill, a formal application is filled out and signed by the applicant’s parents. The application is then reviewed by the Cadet Advisor and, if accepted, the applicant will then be placed on the insurance roster, issued safety equipment, and assigned to an engine. The applicant is now in a “probationary” status. To become an active member of the Program, the applicant must also complete the 10 Basic Skills Tasks according to the standards outlined below. Being an active member allows the cadet to participate in fire ground and other emergency operations. All District policies are set forth by the Fire Chief and approved by the Board of Directors. The Fire Chief may, in turn, appoint an adult Cadet Advisor, who shall be charged with the direct supervision of the Cadet Program. The Cadet Advisor shall have the power to control, order and give direction to all members of the Cadet Program. The Cadet Advisor may reprimand or suspend from the Program, for cause, any member who might knowingly violate rules, regulations, or policies established for the Cadet Program. Have the power to direct, manage, control, organize and assign cadets to various activities. Report directly to the Cadet Advisor and member who, after sufficient time has passed for training and practice, by reason of lack of maturity, accident, lack of sufficient abilities and coordination, or other limitation, does not or cannot safely and promptly perform the skills required to continue as a contributing member of the Program. The Cadet Captain may serve the program in this capacity until 18 years of age or until removed by the Fire Chief or Cadet Advisor or until he/she steps down. First of all, there is always that requirement of paperwork. The Ebbetts Pass Fire District requires that all prospective cadets obtain and complete an application and informational/rules packet. The application and packet can be obtained from the District Secretary at Station # 1 in Arnold during regular weekday business hours (8:00 a.m. to 5:00 p.m.). The application can also be obtained from the link below, printed, and filled out for your convenience. The informational/rules packet contains additional forms that must be obtained from the District office.